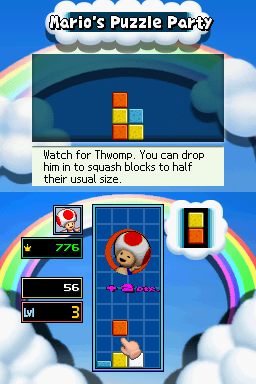 Mario's Puzzle Party is a 4-player minigame found in Mario Party 3; it later reappears as a Puzzle minigame in Mario Party DS. A similar minigame in principle, Mario's Puzzle Party Pro, can be unlocked in Game Guy's room after beating the Millennium Star in the Stardust Battle. The player has to break the colored blocks by connecting two or more blocks to get points. Bricks occasionally fall to obstruct the player (they can be broken by making combos around them, however), while Thwomps occasionally drop and crush the blocks underneath it to half-size, which can aid the player in scoring combos. The player who reaches a certain amount of points (100) wins. If any player runs out of space in the grid to place the blocks, the player's game ends. The last man standing rule can also decide the winner - if everyone but one of the player's game ends, the player that is still running wins, regardless of how many points that player got compared to the others. When playing this minigame in Free Play Room, the score limit can be set from 100 to 1,000 in 100 point increments - once one player reaches that score, the minigame ends and that player wins. In any other mode, the score limit is locked at 100. The Mario Party DS version has a few changes to the minigame. In fact, it functions similarly to Mario's Puzzle Party Pro. The top screen reminds the player about the Thwomps, while the bottom screen shows the entire action. When the player manages to clear the screen of blocks, then the player is awarded 1,000 points. In addition to this, there are levels, which speed the game up the higher they are. The highest level one can get to is 99. Every 40 points the player gets translates to one Mario Party Point. The two-player version, however, is more true to the original Mario's Puzzle Party. Game Rules – "Break blocks by connecting 2 or more of the same color. Thwomps will occasionally fall and squash blocks for you." Advice – "Garbage blocks will break when the colored blocks touching them are broken." Rules (1 player) – "Connect two or more of a similar block type to clear them. Use Thwomps that occasionally fall to squash the blocks down to half size." Rules (2 players) – "Connect two or more of a similar block type to clear them. Whoever reaches 100 points first wins." Tips – "The next block to fall is displayed on the right of the screen. Stack the blocks strategically!" The winning mugshots of six characters playable in both Party Mode and Story Mode who appeared since the first Mario Party are re-used from Mario Party 2. However, Daisy and Waluigi, who can only be used in Party Mode, are the only two characters whose winning mugshots from Mario Party 3 are used, due to this game being their first appearance in the Mario Party series. In the Mario Party DS version of the game, the icons for the characters are changed back to the icons from the N64 games, starting with Super Mario 64. This includes Peach and Daisy, who revert to their pre-GameCube designs. Toad's icon is the only new one, replacing Donkey Kong's; however, he uses new artwork rather than one from the N64 era. This page was last edited on April 19, 2019, at 12:05.